*Simple syrup is your friend. *Alcohol is also your friend. The two different kinds of Sort-of-Sorbet you see here are Mango-Lime and Pineapple-Strawberry. As you can see, neither of them are as smooth as would be achieved with an ice cream maker, but they’re still refreshing and cool on a hot summer day. So for those of you who will be very envious of my ice cream machine in the upcoming months, (and you will be envious, I’ve got some crazy good flavours brewing) remember you can always make Sort-of-Sorbet to soothe your pain before you cry yourselves to sleep at night. Posted by Brilynn at 9:52 a.m. Sounds like a great combination of fruits and looks really good! That is so beautiful with the strawberry pineapple! Gorgeous. Even though I have an ice cream maker, I hardly ever use it. 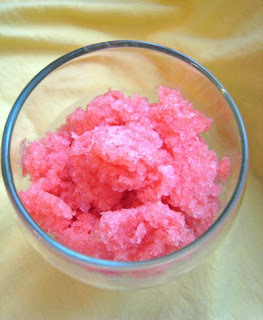 I'll be much more likely to make some variation of this sort-of sorbet! Thanks for the tips! I was just Whining (and wine-ing) last night 'cause I don't have an ice cream maker and really I feel I deserve one! Sort-of-Sorbet seems like a pretty good sub! 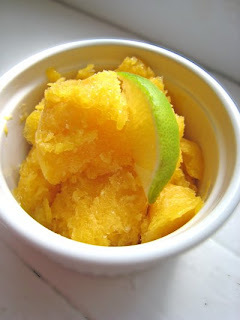 Is "sort of sorbet" the same as granita? Lovely colors and tasty too. lol, I agree--everyone needs an ice cream maker! These two flavors look great. I love your sort-of-sorbets--such gorgeous colors! I'll bet the pineapple strawberry was extra refreshing. What a perfect treat for these hot days coming up on us. I've been wanting to try faux sorbet for a while. I love your tip about including a splash of alcohol to keep it supple.